UNITED NATIONS, September 1 -- In China, the UN Development Program's resident coordinator Khalid Malik's wife Carter runs a non governmental organization which uses the UN connection to raise funds. According to whistleblowing UNDP staff who have contacted Inner City Press, Malik urges donations to his wife's NGO, and some think they are giving to the UN when they give to his wife's NGO. One example of the (intentional) confusion is contained in a Chinese newspaper article, which Inner City Press is putting online here. It is explained below by Inner City Press' sources in UNDP in China. Subject: Nepotism in UNDP China…..poor leadership, bad global staff survey results for fours years….poor staff perception, Mr. Khalid Malik regime continues…..China is awaiting for him to leaving including the government partners…. Dear Mr. Lee, As UNDP China staff, we are so impressed with your serious of articles of Nepotism, stonewall….and we are shocked to see what happened with the whistleblower in RBAP [the Regional Bureau for Asia and the Pacific], however we are not surprised either, as this sounds familiar….It came to our attention of your mention about China, a country full of spirit and inspiration, however UNDP China office is not as pleasant as the bigger China. Here are some examples: UNDP china has stayed at the bottom of global 140s countries from the past four years under Khalid Malik regime….without any improvements, but to him, everybody else is the cause of the problem, but himself. Most importantly, more than a dozen staff, professionalism staff simply have to leave because of Malik's unprofessionalism, unfairness, selfishness, and abuse of authority……..same thing happen when Malik was the head of UNDP Evaluation office….all those professionals had chosen to leave…. The UNDP China staff people’s question is 'how many years of bad Global Staff Survey results it takes to take a senior person out of UNDP China.' There is serious problem of abuse of authority, lack of accountability in those high level post’….and they can do anything they like, recruit people they like, promote people they like, and punish those who tried very hard to maintain their integrity….and all those senior people can do is to ‘get rid of those people’ who did not agree with them through ‘reprofiling’, or ‘restructuring’ and never realize “Leadership” is the biggest problem, their own bad, unprofessional behaviors, selfishness, have resulted in ‘bad staff perception’ as well as ‘bad government partners perception’ of UNDP China. Khalid Malik and Subinay Nandy, are the root cause of problems. 1.She has been in the team leader of HIV/AIDS starting from Sep 17, 2007, so not even TWO year yet. In addition, she being the Team Leader of HIV/AID and Governance starting from Feb 13, 2008. Because of her promotion to this post, in China office we called it ‘incapable leading capable’, all professional staff including Edmund Seattle decided to leave, because it was an ‘insult’ to him. Because all the professionals had choose to leave, Grace Wang inherited all other people’s credit on HIV and Governance because it is all other people, Edmund seattle, Diana Gao, Edward Wu, Li Jing, (all left) laid the ground work. 2.Staff perception about the HR issue can be found very clearly in the four years of BAD GSS results on transparency, management integrity, honesty, trustfulness, HR recruitment, selection, and promotion process, of all these indicators are very slow for Four FULL years. 3.It is UNDP HR policy and requirement that ONE has to be in his/her current Post for a minimum of 3 Year to apply for the next…. She has been team leader of governance only ONE YEAR and FOUR Months (starting from Feb 13, 2008). This is AGAINST UNDP policy, there is seriously suspect of abuse of authority in the hiring, selection process…. 4.Employing such a person without relevant and solid experiences, knowledge, proven competencies as a practitioner in UNDP HQ of BDP the policy bureau is jeopardizing UNDP’s image and reputation (it has to be the right person and qualified person for the right job). 5.UNDP has the policy of rank in post and even with is and the interview, this should be only part of the consideration as proven performance, knowledge, results and competence to fit in the post should also be considered and are critical. This is the most important thing. She has not demonstrated the necessary and proven results, competencies and knowledge for this high level P5 post which is obvious. Reference check should also be made thoroughly not only with the Resident coordinator Mr. Khalid Malik and Country Director Subinay Nandy, but also with the peers of the UNDP China (all the team leaders and the left ones who used to interact with her), Ms. Wang’s previous supervisees Li Jing left the office because he thinks UNDP does not have ‘governance’ in people selection, only those kisses can get up or get the job, and the selection should be made in a transparent and competitive process. 6.One key factor is that UNDP China Resident coordinator will leave (all government partners are waiting for his departure after Six years in China) and favoritism should be avoided for promotion and international assignment for UNDP HQ and in China Country Office. UNDP China HR function is ONLY an implementer of all those action from Khalid Malik and Subinay Nandy, HR transparency has been of complain of staff for many years. UNDP China has poor GSS results for years and HR related issues has lots of problems and issues on performance assessment, recruitment and promotion in terms of fairness and transparency. Inner City Press is attaching to this article documentation of the staff's assessment of Malik from 2005 to 2008. Conflict of interest between Khalid Malik’s wife private foundation Yunnan Mountain Handicraft Center with Khalid Malik’s using of UN, UNDP, private sector funding and other resources to benefit his wife's foundation. Khalid Malik has had pretty long interests in Tibet and everybody does. However, his behaviors have made staff suspicious of his real motives whether it is to concentrate on development or using this as an excuse to get benefit for himself or his wife and his family using UN’s name and his position in UN. 1.In 2007 UN Day, using UN resources, most likely private sector resources mobilized (Private sector contribution to RC), an UN Day event was organized by inviting Naxi Guyue (a band from Yunnan Lijiang, headed by Yuan Ke) around 50 people to conduct a performance. This is justified of supporting of culture development in Yuannan. 3.This is not the first UN Day in years time….people are discussing whether the choice of each UN day is Mr. Malik’s decision or his wife’s, and what is the real purpose Advocate for UN or using UN or UNDP’s resources to benefit his own personal interests, building connection in both tangible and intangible terms. 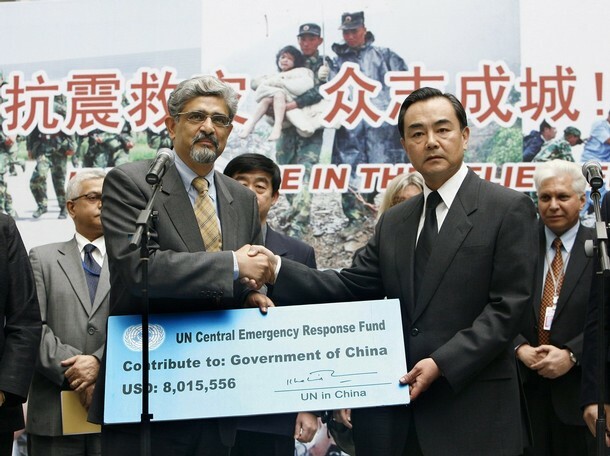 4.The news clip proves that right after the Naxi Guyue music performance on Oct 25, 2007 in UN compound, the head of Naxi Guyue Mr. Xuan Ke announced publicly to donate rmb 100,000 ($15,000USD) to his wife’s private foundation. The title of the article in Chinese is ‘Mr. Xuan ke donates rmb 100,000 to UN’, but it actually donated to Carter Malik’s private foundation. 5.There are also two evidences that two workshops had been organized in Ms. Malik’s foundation in Yunnan, with multiple government official been invited….The funding of these workshops are very unclear….based on UNDP rules and procedures….and policies, it is very inappropriate to use any public resources including money or intangible resources such as name, brand for personal purposes. We did heard from some government partners who was invited saying that they believed it was an UNDP meeting, however, it ended up in his wife foundation…..
6.The other clips have shown the activities of UNDP project in partnership with All China Federation of Industry and Commerce….in Yunnan….but as time accumulated, (since we did not know from the beginning why he is so much interested in Yunnan)….now become more clear that anything in Yunnan connected with his wife’s interest in Yunnan….and potential connection with government officials, business, and benefits for his family using agency resources including UN, UNDP, private sector funding…..for his potential network for future. 7.Despite Culture is not an UNDP mandate, Khalid still insisted to formulate a UNDP project on culture….and handcraft making….all related to his wife interests…most important of all, all these was used purposely for his application of job in UNWTO….which are very much focusing on tourism…culture….aspect. However, all these things everybody knows in UNDP, China, HQ….however, it is in such a grey area to be used as evidence against Khalik….but it happens all the time. 8.Ms. Malik foundation is recruiting for interns…and there are five of them all working in Mr. Malik’s private promise in UN compound. However, the network is not fast enough with five people working at him home and she requested IT to upgrade their home network. It was done with UNDP XB resources of RMB 6000 ($900). Everyone staff knows that XB china is almost gone….however, this is not the only time that their personal expenses were changed to UNDP XB account…. (finance have all the record). This is an integrity issue….all these expenses adding up together may be or may not be very big, however, this is Fraud and Abuse of authority of inappropriate use of UNDP funds…..
UNDP's Office of Audit and Investiations is already supposedly investigating the Regional Bureau for Asia and the Pacific's having given a job to the daughter of the UN's envoy to the Congo Alan Doss, who was until July 1 a UNDP staff member and therefore needed and asked for "leeway" for the hiring of his daughter. UNDP appears to be stalling the investigation, which involves personnel long acquainted with Doss; UNDP has also declined to provide a press conference by Administrator Helen Clark, and tries to micro-manage who can interview her. At an appearance in UN Headquarters basement by Malik, UNDP rushed him off for other interviews. Other questions to UNDP have remained unanswered since August 13. Watch this site. UNITED NATIONS, August 13, updated* -- With the UN hoping to put behind it the hybrid nepotism and biting scandal brought to light by UN Congo envoy Alan Doss' email to the UN Development Program asking for "leeway" in hiring his daughter Rebecca being published by Inner City Press, spokesperson Marie Okabe on August 12 replied to questions about immunity and whether the Secretary General will allow UN Security personnel to testify against the alleged biter by saying that "all queries should be addressed to the New York County District Attorney’s office." Video here. *She has since provided a wider statement about the alleged nepotism, which will be reported in a separate article on this site shortly. But from within UNDP, sources tell Inner City Press of a multi part strategy to try to moot out the scandal. UNDP's investigation, they say, involves one Francois Dubois and long-time associates of Alan Doss. Beyond and reflecting what they call this conflict of interest, they say that the supposed investigation has become an attempt to justify, post facto, the violation of the spirit and letter of UNDP and UN rules by focusing on leave time that Alan Doss had accumulated. Despite Doss himself having told Inner City Press in writing that he tranferred from UNDP to the Department of Peacekeeping Operations on July 1, 2009, after his daughter was short listed for and offered the UNDP job, an attempt is afoot to claim that before his July 1 "arrival" at DPKO, Doss was already not at UNDP at least technically. Doss may have asked in an unseemly way for "leeway," the theory goes, but he didn't need it. Beyond the open request for the bending or breaking of rules, for a UN official as high placed as Alan Doss to write in this way about giving a job to his daughter is inappropriate. Many in the UN express amazement that there have as of yet been no repurcussions. On August 13, Inner City Press directly asked UNDP's spokesman Stephane Dujarric -- as well as Messrs. Doss and Dubois, and Adminstrator Helen Clark's chief of staff -- to respond to what these UNDP sources are saying, and to confirm or deny Dubois' role in the investigation as well as the matters below. Ignoring the pointed questions, Dujarric twice repeated boilerplate that the investigation is serious, and that Ms. Clark routinely speaks with the press. Why then has she still not done a press conference after 100 days in office, while UNDP reaches out to particular reporters they think will give her uncritical coverage? The UNDP sources, disgusted by what they call a cover up, assert that UNDP seeks to moot out the controversy by moving Rebecca Doss from the contested position in New York within the Regional Bureau for Asia and the Pacific to a job in Copenhagen. The sources say that the vacancy announcement for this post, like the one the Dosses took a P-2 position, has mysteriously been taken offline by UNDP, to be used to "solve the problem." Relatedly, to quell the other side of the controversy, some point to a just withdrawn vacancy announcement for a post within the Regional Bureau for Europe and the CIS States in Bratislava. 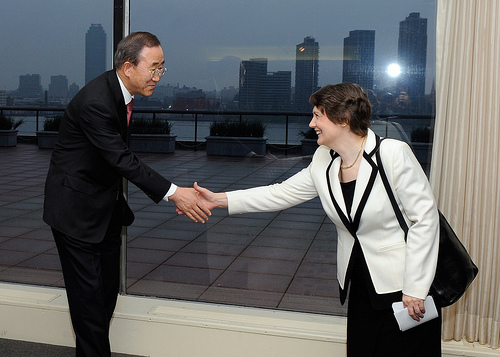 "This is how things are done in the UN," a source tells Inner City Press. "Especially at UNDP where there is additional dirt not yet revealed." While each Regional Bureau within UNDP has skeletons in its closet, RBAP has covered and covered up programs in totalitarian countries like Myanmar and North Korea, and war crime sites like Bangladesh and Sri Lanka. In Myanmar, for example, sources describe to Inner City Press how UNDP paid inflated prices to the government of General Than Shwe for telephones and license plates, "essentially propping up the regime," the sources say. Inner City Press has asked UNDP directly, how much has it paid in Myanmar for phones and license plates; UNDP's answer will be reported when provided. In Bangladesh, where UNDP has said it would help set up and advise on an inquiry into actions by Pakistan in the early 1970s, such efforts have reportedly slowed since Helen Clark took the top job earlier this year. She met with representatives of Pakistan, and now progress in setting up the inquiry into alleged Pakistani war crimes has become less clear. Inner City Press has asked UNDP and Ms. Clark's chief of staff to respond to UNDP sources statement that "Ms. Clark met with Pakistan representative(s) and UNDP's commitment to assisting in the investigating possible Pakistani war crimes has since changed." The response, if and when received, will be published on this site. Perhaps most explosively, RBEP oversaw the closing and now reopening of UNDP's program in North Korea. Sources say that under the name of programs on the books of UNDP in China, actions in North Korea continued even during a supposed lull. One Napoleon Navarro was shifted from covering North Korea to becoming one of four UNDP deputies in China. The UNDP's top man in China, Khalid Malik, is reportedly seeking to shift to the top post at the UN World Tourism Organization based in Spain. Local UNDP staff in China have been complaining about Malik's reign in Beijing. Regarding Alan Doss himself, questions have arisen about his attempted use of UN Volunteers posts for relatives while he was in Liberia, and about the use of UN Mission resources while in the Congo. At the Augst 12 noon briefing, Inner City Press asked Ms. Okabe to clarify whether the Congo, including its capital Kinshasa, is or is not a "family post" for UN purposes. Twenty eight hours later, no answer has arrived. Watch this site. "please confirm that investigation involved Francois Dubois, and that he is an acquaintance and more of Mr. Alan Doss. I am cc-ing both gentlemen. Also, I'm told a move is afoot to recalculate / use Mr. Doss' leave time as a solution to the irregularity that has surfaced. On Bangladesh, I am asking about the status of UNDP's previous projection that it would help set up a war crimes inquiry. To help you respond, I have been told by a UNDP source that Ms. Clark met with Pakistan representative(s) and UNDP's commitment to assisting in the investigating possible Pakistani war crimes has since changed. Please comment on this [and] confirm or deny: Rebecca Doss is being considered for a job in Copenhagen.. please state UNDP's jurisdiction over the acts of Alan Doss, no longer with UNDP, and whether his acts are being investigated by UNDP and could be acted on by UNDP." "Regarding questions about Miss Doss and the investigation, I can tell you that the allegations suggesting irregularities in the recruitment procedures are serious and are being fully investigated by UNDP’s Office of Audit and Investigations, in conjunction with OIOS. The matter is being given top priority. On Bangladesh, I will revert. On Miss Clark’s appearance, she speaks to journalists regularly and looks forward to engaging with journalists in the UN press corps. On Myanmar, I’m trying to see what can be found."